My stay was very good, he staff were very friendly. The breakfast was included for people under 27 which was great. There wasn't a lot of variety at the breakfast buffet but it was free food and it was pretty good. Safe, bright hostel with very friendly staff. Beautiful view from the common area upstairs. 6-bed room had an ensuite bathroom with fantastic shower. Worth noting: the food available on-site outside of breakfast hours (7-10am) was minimal. I'd stay again for a short period of time. However, the lack of no plugs anywhere near my bed or the lockers made charging my phone overnight difficult in a shared dorm. I had to rely on my power bank, which would be frustrating for longer stays. Amazing staff! Only a couple of short metro stops from the main city. Also: bed linens, towels, and hair dryers are now free! Didn’t charge my friend and I a cent for them. They also had a straightener to use which was a big plus for me. The bathrooms are big and spacious, and everything was super clean. I’d definitely stay here again! 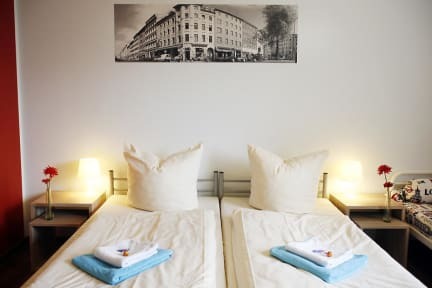 Stayed in a 6 bed private w ensuite +ves: Clean room and bathroom, good hot shower, nice staff on reception, good location next to 2 train stations, warm bread rolls at breakfast, -ves: have to pay for bed linen - who brings bed linen with them on holiday? Solo female - my trip was a little ruined because a guy in my room never showered or left the room so my room smelled nauseatingly terrible. Not the hostels fault. No one hung out in the common rooms so I didn't meet anyone to hang out with. Super close to transit and walking distance to museums/fun/food. Clean. Friendly staff. I recommend. My friends and I stayed here twice; I think that says enough! 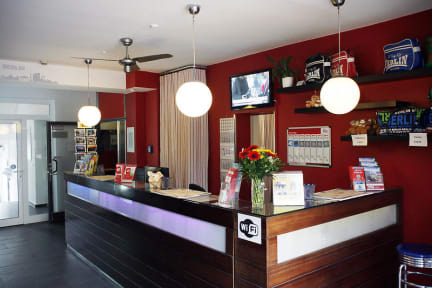 In case it doesn't: the staff is friendly, well-informed, and helpful; the hostel has everything you might need (including free parking for guests); and though it isn't located smack in the centre of everything, it's very easy to get to where you want to go. The breakfast spread is impressive and worth the money, and on nice days you can have it out on the roof terrace. Tip: The nearby bar Zyankali is worth a visit. Fantastic hostel! Staff was helpful, breakfast was amazing, the room was nice and it had its own bathroom. I am a solo backpacker and didn’t meet anyone there, as there isn’t really a common room. There were a lot of families and it felt more like a hotel. I loved the room keys and the 24 hour reception. Overall would recommend! Good hostel and in a good area! close walk to a bunch of great restaurants and cool bars. The staff is super friendly and offered alot of good advice. only complaint was that the common areas were pretty barren at times. not a very social hostel from what i could see. but is a place to crash in a popular area of town for nothing too crazy price wise!